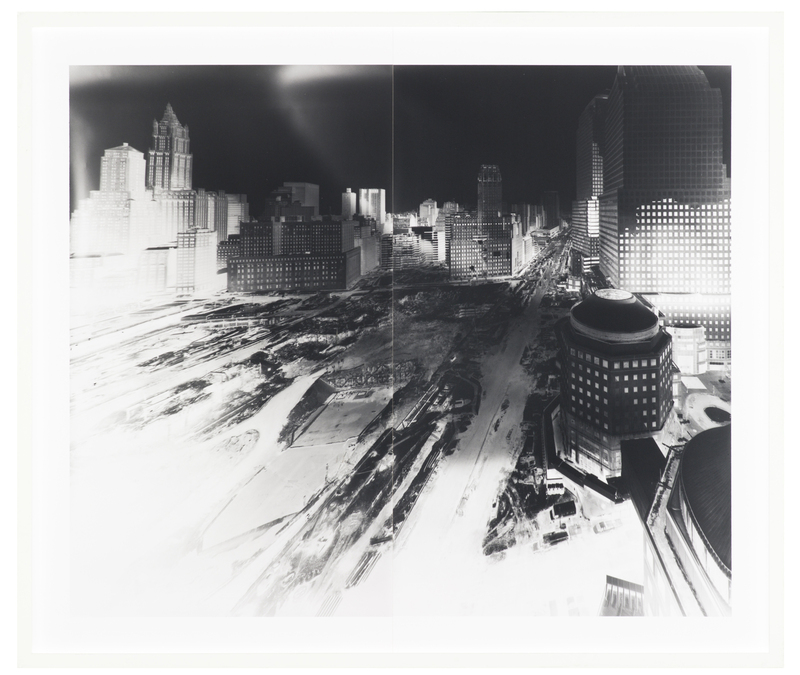 Vera Lutter, "Ground Zero III, January 15 - 25, 2002"
9/11/01 Was a Tuesday. Anyone who’s ever worked at Newcity knows what that means: deadline day. Starting Friday on this site, you can read about that day at Newcity, and read our resulting coverage. Meanwhile, many civic and arts organizations will be commemorating the tenth anniversary of that dark day in American history this week. The Museum of Contemporary Art recently opened this exhibition of Lutter’s work to commemorate the anniversary of 9/11. Lutter transformed a room in a building across the street from Ground Zero into a giant photographic lens to produce large-scale negatives of the site for this memorial display. Open through September 12 at the MCA. Oracle Theatre’s production of “Life Separates Us,” a play set a few months after the September 11 attacks, runs in conjunction with an art exhibition curated by the artistic director of Oracle Art. The exhibit features Chicago artists exploring the cultural impact and implications of 9/11. Opens September 2 at Oracle Theatre. Free, but reservation recommended. Bailiwick Chicago and Teatro Luna will explore the cultural state of North America after 9/11 through visual art, music, a performance of selections from the upcoming world premiere of “The North/South Plays” and a town-hall panel discussion. The panel includes journalist Marcus Riley, WBEZ’s Alison Cuddy and comedian Mikey-O. September 7 at the Instituto Cervantes of Chicago, 31 West Ohio. 7pm. Tickets start at $30. Granta’s “Ten Years Later” issue addresses life since 9/11 through a selection of new fiction, reportage, memoir, poetry and photography. Several of the issue’s contributors will be present at the Chicago launch, including New York Times columnist Anthony Shadid and former political refugee Nuruddin Farah as well as novelists Aleksandar Hemon and Nami Mun. September 8, 7pm at Barbara’s Bookstore, 1218 South Halsted. Free. This award-winning documentary made by Chicago-based filmmakers opens in time for the tenth anniversary of 9/11. “Fordson” is the story of a football team from a predominantly Arab-American high school, and their struggle to prepare for their varsity game against their rivals during Ramadan. Opens September 9 at AMC Theatres. In honor of the tenth anniversary of 9/11, the Lyric’s annual outdoor concert is dedicated to the victims of the tragedy, their families and the men and women of the armed service. Featured artists include René Barbera, Jamie Barton, Anna Christy and Lyric Creative Consultant Reneé Fleming. September 10 at 7:30 at the Pritzker Pavilion. Free. Joan Curto, David Edelfelt, Carla Gordon, Beckie Menzie, Tom Michael and Wayne Richards perform at the Illinois Holocaust Museum to honor the victims of the 9/11 attacks through song and story. Proceeds will benefit the museum and its educational program. September 11 at 9603 Woods, Skokie. 2pm. $14/$6 for museum members. The Chicago History Museum opens a special edition of their monthly “In the K/Now” series to examine contemporary history through the lens of September 11. Moderated by journalist Laura Washington, featured panelists include the producer of WBEZ’s “Worldview” and the executive director of the Inner City Muslim Action Network. September 11 at the Chicago History Museum. 1:30pm. Free, but reservation recommended.